This ready-made PowerPoint presentation can be used by state health and education departments, schools, and other partners to explain the value and importance of the WSCC model and describe how it can be put into practice. It highlights brief examples from districts that have successfully implemented the WSCC model as well as relevant tools and resources. The presentation can be modified to meet the needs of various audiences and includes detailed speaker notes (available within the PowerPoint and as a separate Word document). The Whole School, Whole Community, Whole Child (WSCC) model uses an integrated, collaborative approach to address barriers and supports related to learning and health. This implementation guide is designed with a variety of readers in mind, including administrators, teachers, and other school-and district-level staff, community partners, public health professionals, parents and others interested in strengthening the learning and health of students. 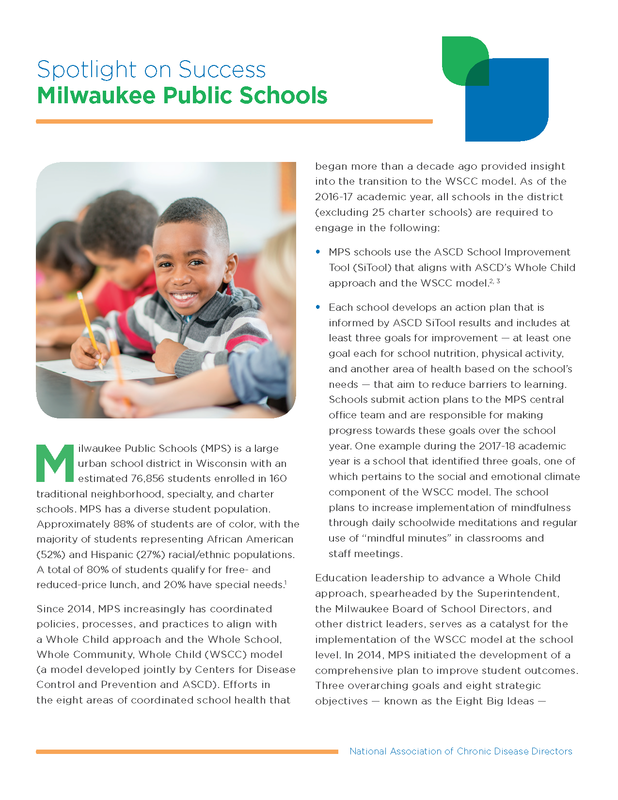 Part I provides an overview of the WSCC model and the Whole Child Tenets (ASCD), highlights opportunities for alignment with school, district, state and national policies and practices, and provides examples of integrating the model with goals in school and district-level improvement plans. Part II gives step-by-step guidance for districts and schools seeking to adopt and implement the WSCC model. The issue brief is directed to state health departments and state education department partners with a focus on school health and nursing services and aims to help inform and strengthen school and hospital partnership related to the management of chronic health conditions in schools. It describes and provides examples of how schools and hospitals can capitalize on opportunities offered through the Affordable Care Act (ACA), including the community health needs assessment requirements for non-profit hospitals under ACA, and other policy and program opportunities to improve health and education outcomes for children. In addition, it features specific strategies and resources for state health departments to consider as they move forward in this area. This publication highlights how state education and health departments can help lead the way in reducing absenteeism through a comprehensive approach that is inclusive of addressing chronic health conditions. It describes connections between school attendance and chronic health conditions, discusses challenges and opportunities for data collection and use, and promotes the integration of school health services, specifically nursing, into efforts to improve school attendance. The document provides recommendations for action and features successes within various states and communities. School improvement plans provide a systematic opportunity to address the needs of the whole child, incorporating physical, social, emotional and/or behavioral health priorities into schools. This guide is designed to provide public health agencies and other education partners an understanding of improvement plans and their purpose and role in schools and districts. It outlines opportunities to incorporate health and wellness-related goals and aligned activities into the improvement planning process, and highlights useful examples from a state, district and schools that have done it. As leaders across the country seek to improve student health, there is a growing need for tools to help navigate the complex world of school health policy. The National Association of Chronic Disease Directors (NACDD), National Association of State Boards of Education (NASBE) and the Society of Health and Physical Educators (SHAPE America) have worked together to develop the State School Health Policy Matrix 2.0, an updated guide to state-level school health policies for the following topics: competitive foods and beverages, physical education and physical activity, and administration of medication in the school environment. The State School Health Policy Matrix 2.0 outlines relevant state-level policies for each of these areas, including a direct link to the policy. It also it indicates which political entity or agency adopted the policy or issued guidance, helping to answer the question – Who has historically had the authority to make policy changes in the areas of competitive foods and beverages, physical education and physical activity, and administration of medication in each state? Additional resources from Partnering for Success, including a workshop script and one-pagers can be found here.